Dr. Staci Safady is a board certified audiologist with 21 years of audiology experience. Staci’s impressive range of experience includes work in hospitals, clinics, and private practices, where she has developed a reputation for expert and personable care. The majority of her experience, however, has been devoted to helping her patients hear better through compassionate, individualized care. Staci holds a Doctorate in Audiology from the Pennsylvania College of Optometry, a Master of Science degree from the University of Wisconsin-Madison, and a Bachelor of Arts degree from the University of Pittsburgh. 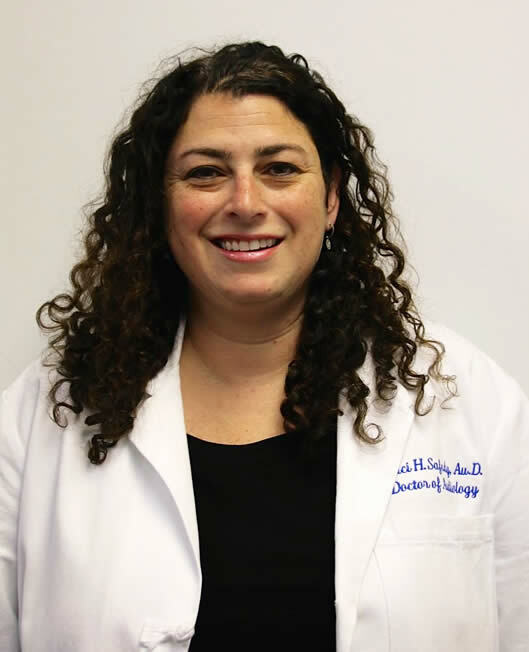 She has been employed at University Otolaryngology Associates since January of 2004 specializing in diagnostic audiologic evaluations, vestibular evaluations, hearing aid counseling, hearing aid evaluation and fittings, repairs and follow up of care. She holds a Clinical Competency Certificate from the American Speech-Language- Hearing Association, a Board Certification from the American Board of Audiology and is a Fellow of the American Academy of Audiology. She is board licensed and certified in the Commonwealth of Pennsylvania and the State of New Jersey. Staci is a member of the American Academy of Audiology and the American Speech-Language- Hearing Association. She also received the Continuing Education Award from 2008-2013. Besides helping people improve their lives through better hearing, Staci’s other passions include teaching fitness classes and spending time with her nieces and nephews. Dr. Safady is mainly located at University Otolaryngology Associates divisions in Center City Philadelphia and Northeast Philadelphia. © ENT Ear, Nose, and Throat Website Design & Medical Website Design | Medical Web Design by Vital Element, Inc.